A few months ago I set out to get a new laptop for my wife. She only had one requirement, after having shared a Macbook Pro with me for the past couple years: that it ran Windows (queue OS flamewar). 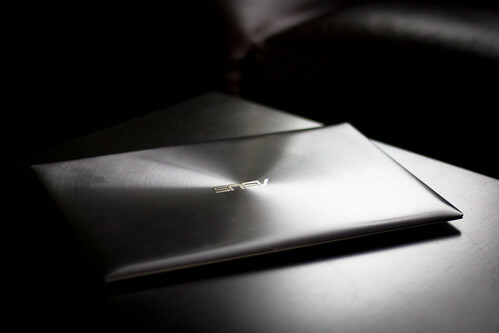 I quickly decided I wanted to give her something slick and light, and look at the new line of ultrabooks. I then narrowed the choices down to the Samsung Series 9 and the ASUS Zenbook by reading reviews online… but that was just the easy part. Much has been said already about the shopping and out-of-the-box experience of PCs, compared to that of Macs, but I think we should keep beating that dead horse until it’s underground. So keep reading for much deceased equidae action. The first step is to actually get your hands on the models you’re looking for. But if it’s easy with a Mac – just walk into any Apple store or Best Buy or whatever – it’s not that easy with a PC. Different stores carry different models, have different deals with manufacturers, and have different supply chains. Even given one store franchise, the availability of models will vary from store to store, and that’s not counting which ones are actually available on display: for some reason, a lot of stores wouldn’t let you touch expensive laptops like the 2 ones I wanted to try. Paradoxically, the Apple mini-store located in the next aisle would always happily provide multiple copies of each of their devices for people to play with. In my case, London Drugs (here in Vancouver, Canada) was one of the only stores to carry the 2 models I was looking for – the whole point being to compare them side by side. But it still took me several visits to several stores all around town to find one with both units actually on display. High-end laptops are already well taken care of by Apple, so shelf space is reserved for feature, mainstream, or budget oriented models from PC brands. Windows power-users therefore get forgotten in the process. Some stores have issues securing those new ultrabooks, so they end up not having them on display at all. 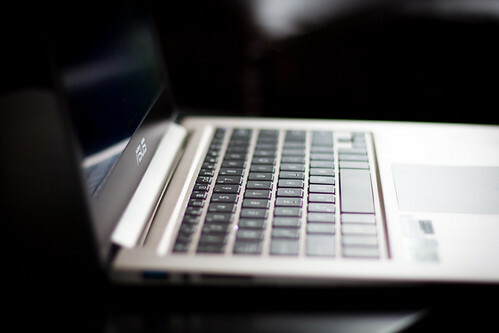 Unlike Apple, which provides appropriate locks for the Macbook Air, other manufacturers leave it up to the stores, who often use generic, bulky locks. But those locks often don’t work with ultra-thin cases… and when they do, they’re almost as heavy as the laptop itself, which completely ruins the experience of trying it out. 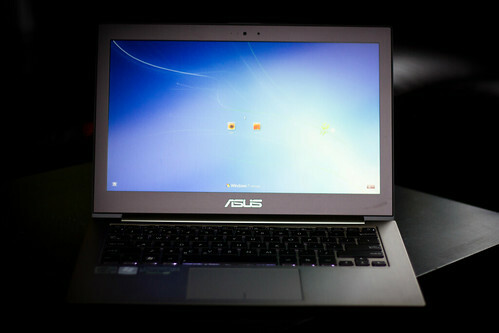 I eventually managed to test the models I was considering, and quickly decided the ASUS Zenbook would work better. Good news: the Zenbook Prime was just about to be released, with a much nicer body design and a supposedly better trackpad… so after a couple weeks waiting for that one to show up in store, I came back home one day with my precious gift. The Zenbook is a beautiful machine, but like many PCs it comes with a bunch of ugly stickers. This is always totally baffling to me: what’s the point? Are people going to look at your laptop at Starbucks and go “_I see your laptop has an Intel CPU inside! Mine too, this is so awesome! Much better than AMD, don’t you think?_”. No, all they do is waste 5 minutes of your time as you remove them and then clean up the sticky bits that they leave behind. The silver lining in this case was that all 3 stickers that come on the Zenbook are mostly in grey-ish tones similar to the laptop’s body – no flashy ugly colors here. So it’s not completely horrible. Just annoying. Another expected downside of buying a PC: all the bloatware that comes pre-loaded with it. Everything, from the moderately useful to the totally useless, can be found on the Zenbook once you boot it up. I counted around 20 “utilities” installed. Of course, I opted for the usual practice of wiping everything and installing a fresh Windows on it. I had to fight the BIOS for a long time, trying to get the default GUID Partition Table to work with my bootable USB key. But the UEFI boot mode wouldn’t work for some reason, so eventually I gave up, re-allocating the whole hard drive as a more classic Master Boot Record partition. It’s kinda sad, this being 2012 and all, but as I understand it, I’m not losing much when it comes to a single 128Gb partition. Of course, once Windows is installed, the fun has only begun: you still have to go to ASUS' website to get the drivers for all kinds of components, along with downloading a whole bunch of updates from Microsoft. 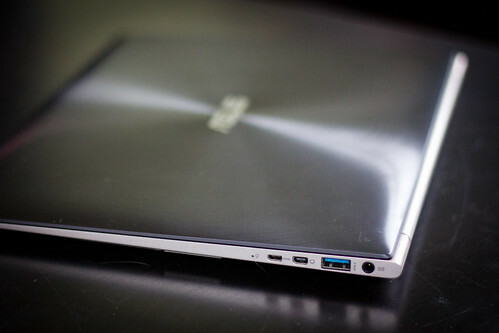 The Zenbook Prime, once you’ve been through all those hoops, is a wonderful little machine. It looks gorgeous, is very portable, and the performance is pretty good. The accessories are also nice, especially the leather-ish case for both the laptop and some of the cables. The power cable is the only poorly designed component in the whole package in my opinion, but overall, I recommend this laptop highly. Go into any computer store. I guess Microsoft Stores and Samsung Stores and the like are trying to address the issue, but it’s a long way away.